What caused a fight inside the Big Brother Naija house this morning was a mere French Toast Recipe. Bisola allegedly made some negative remarks about TBoss’s french toast recipe and she couldn’t have any of it. 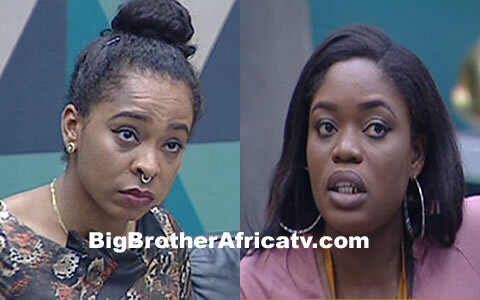 Even though Big Brother Naija housemates Bisola and TBoss seem to have what one can call a cordial relationship and the game clearly shows how ThinTallTony has managed to dominate both parties, their argument this morning was something else. Love my Igwe, marvis and Bisola so much! I envy the respect and appreciaiton they have for each other as friends! I adore DebbieRise...Bassey u r such an awesome fighter! Just stop nominating Efe..LoL..u r one of the msot focused people in that house!! !but my vote will always go to Efe..anytime, anyday! cause he is in there to win it!! Mwa says so. NM, South Africa!! TBoss is really irritating, Point of correction, Bisola did not give any negative remark on Tboss's recipe instead Tboss was asking so many questions that sounded like Bisola did not know what she was doing or she didnt know the standard recipe for french toast and that made Bisola go off on her but TBoss on the other hand took it too far like a child, she behaves like shez dealing with some issues, she could have as well walked away but no she stayed and kept shouting. I tot i liked her but man shez sick, she has really stooped too low. She is the common factor when it comes to fights in that house. I am sick of her, see the way she disrespected Bassy HOH... msheww...she just needs to get out of the house. At first, she use to be my favorite...I mean Tboss, but all of a sudden, I started hating her cause I see very clearly she's some kind of serpent-like female. The gurl bores I and the whole of my family now like crazy that whenever the screen was centered on her, we want to change frm that station. If she's not evicted this time, then I take it that big brother has a special interest for her.